Two Curry School of Education alumni found their own schooling to be great preparation for starting their own business, a treadmill-based fitness studio called tread HAPPY. What was formerly an auto glass repair shop has become a place for people to run in rhythm and sweat in unison. Previously filled with motionless cars in need of service and repairs, the building at 103 8th Street Northwest in Charlottesville is now bursting at its seams with the movement that is taking place inside. A dozen treadmills occupy the space, and though they don’t cover any ground, the people operating them are anything but stationary as they accumulate miles upon miles. 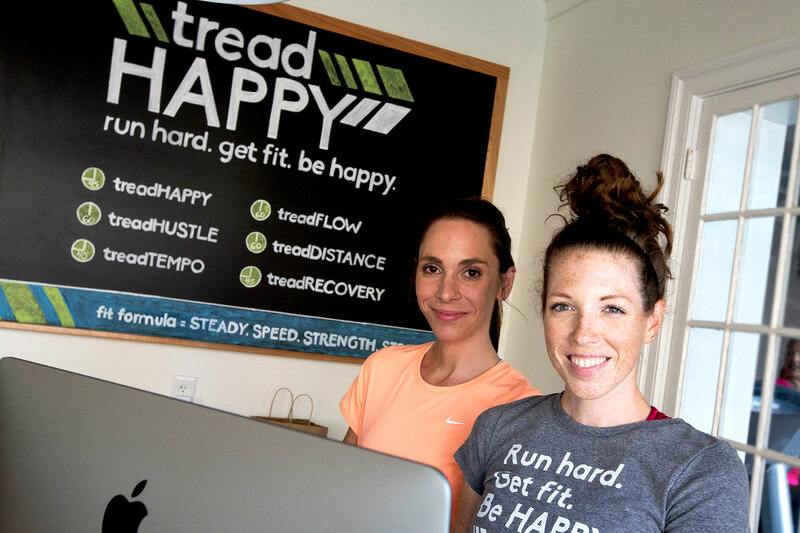 The building’s business, a treadmill-based fitness studio called tread HAPPY, opened its doors to the community in February, and leading its charge is a couple of University of Virginia Curry School of Education alumni, Claire Mitchell and Sara Yeatman Currier. Mitchell and Currier, educators and now business owners, started dreaming up the plans for tread HAPPY after forming a friendship over their mutual love of fitness. In the winter of 2015, Mitchell and Currier arranged to meet at a gym for a treadmill run so they could avoid slippery, snow-and-ice-glazed streets. On the surface, many wouldn’t equate a degree in education with the skillset required to become an entrepreneur. Mitchell begged to differ. An education from the Curry School combined with years of professional experience standing at the front of classroom equipped both Mitchell and Currier with an array of capabilities that have proved fruitful in their quest to become business owners: the ability to motivate, inform and instruct clients, along with superb interpersonal and organizational skills. Since its unveiling, tread HAPPY has attracted approximately 500 clients who are eager to push their bodies to their limits in the community’s newest niche studio. Each week, the studio offers six different classes that incorporate speed work, aerobic fitness, strength training, flexibility and active recovery – all led by an experienced coach and member of the tread HAPPY staff. Combined, Mitchell, a marathon runner and certified running coach, and Currier, a former collegiate volleyball player, have been teaching for 12 years. Both Currier, a teacher at Brownsville Elementary School, and Mitchell, a researcher in the Curry School’s Curriculum, Instruction and Special Education Department, agree that their roles as teachers as well as business owners and coaches are about one thing: getting the best out of others. According to Mitchell, one of the most unique aspects about tread HAPPY is that it allows recreational runners and elite runners to train side-by-side in a high-energy atmosphere. Currier and Mitchell are Charlottesville transplants, hailing from North Carolina and Michigan, respectively, but they wanted to open their studio in the heart of the town they’ve grown to love.